Ring terminals are the most secure type of tongue style connectors because they cannot slip off a screw or stud. They should be used on all critical circuits. 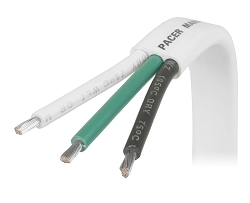 These heatshrink terminals offer the best corrosion resistance as when heated, these connectors form a water tight seal and the ultimate vibration and strain relief. The terminal shrinks over the wire and makes a waterproof seal which prevents moisture from wicking up the wire.